The Jerusalem cross is the symbol of the Equestrian Order of the Holy Sepulchre of Jerusalem in which Dr. Guest holds the rank of Knight Grand Cross. The cross moline is taken from the arms of the American Priory of the Sylvestrian Benedictines and is a reference to Dr. Guest’s station as a Benedictine Oblate. 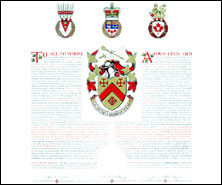 The sword and arm are taken from the crest and badge of the Clan MacRae, and honours Dr. Guest’s maternal ancestry. 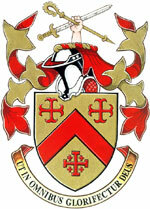 The crozier is taken from arms associated with the Guest family. This Latin phrase means “That in all things God will be glorified”.